We work with the Department of Consumer Affairs, Government of India, to power their Smart Consumer mobile app that helps brand owners to connect with consumers directly. Click here to read the notification for brands. The app is powered by GS1 India’s DataKart. By scanning a product's barcode, the Smart Consumer mobile app empowers consumers with digital product information on a product’s name, date of manufacture, MRP, net content, along with manufacturer details and consumer care details. Access to this marking/labelling information through the app becomes especially important when labelling information on a consumer pack is difficult to read due to its small font size. Consumers can also use the app to verify the company/product information given on the label and to connect with brands. Through a recent circular, FSSAI requires food companies to publish their FSSAI license numbers along with products’ expiry/best before date to the Smart Consumer app. This is a step toward furthering the vision of Digital India of Government of India. AGMARK directs all its packers to comply with the Smart Consumer requirements by uploading all their product information in GS1 India’s DataKart service. Read the AGMARK letter to its packers. This is aimed at empowering consumers to authenticate AGMARK certificates on products, and hence, increasing their confidence on the use of AGMARK certified products. 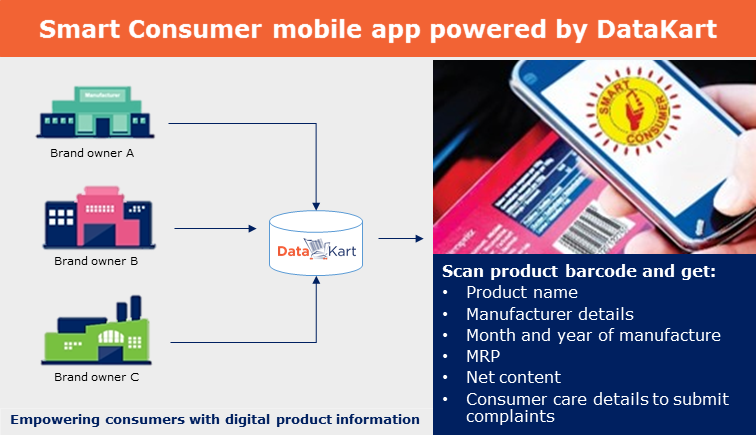 To publish your product information in Smart Consumer app, upload it in DataKart.